34. Turkey. Mercedes S-class. The Turkish PM's security detail was investigated recently after a scary (and later amusing) incident. The PM suffered from low blood sugar levels and was semi-conscious. He was rushed to the hospital. Upon arriving, his security guards jumped out of the Mercedes and slammed their doors. The doors automatically locked behind them, with the PM slumped over in the back seat. No one had a spare key and the bulletproof glass was hard to break. They had to borrow equipment from a nearby construction site in order to extricate the PM, who is now fine. 35. Singapore. The younger Lee and other high Singaporean officials ride in official looking black S-classes. But the real story is the elder Lee's switch. In his retirement, Lee Kwan Yew traded in his Mercedes for a Lexus. Asked to explain, the former PM said-- With a Lexus, I spend less time at shop getting the car serviced. 36. Kazakhstan. The billionaire autocrat rides in a Merc S-class. No surprise. His license plate reads: 01 KZ. Okay, we get it, you're our glorious leader. 37. Myanmar. Than Shwe, the country's de facto ruler, is a no non-sense military man. 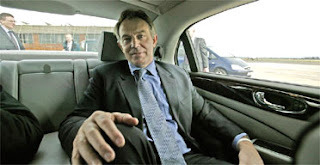 Despite influences from the local elites to get a Mercedes like every other third world strongman, he has never wavered from his Land Cruiser. 38. Nepal. 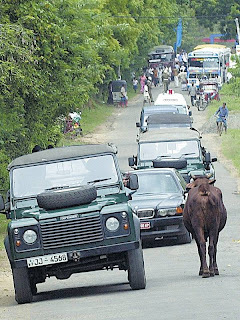 The Maoist insurrection, the royal killing spree, and the breakdown of civil society have made Nepal chaotic. 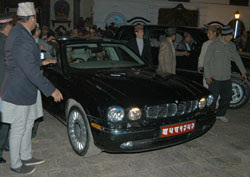 Here, King Gyanendra in his Jag was being pelted with stones and other projectiles. Poor guy. 39. Indonesia. 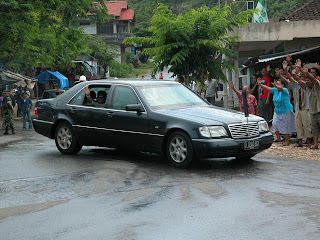 Like Gloria Arroyo, Indonesia's PM rides in a W140 Merc. With cheering crowds alongside the road, we see Yudhoyono and his wife with their window briefly rolled down. 40. Thailand. 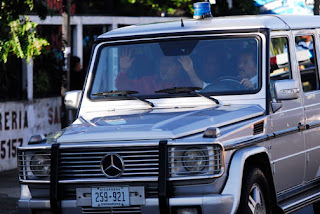 Former PM Shinawatra, after escalating his war against druglords, switched his official car from a Mercedes sedan to an armored van for more protection. 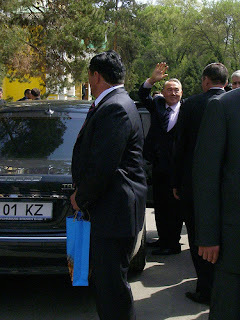 After the bloodless coup, his successor the interim PM continues the tradition and now rides in a VW T5 Eurovan. He has to protect himself not only from drug lords and Muslim separatists, but Shinawatra supporters as well. Today, we delve into world leaders and their Volkswagens. A few surprises here. 28. Czech Republic. Skoda, one of the oldest car companies in the Czech Republic (and the world), has been a VW subsidiary since 1991. President Vaclav Klaus, as the president of an auto producing nation, has to ride in a domestic car. A 2.8 liter six cylinder engine propels this mid-sized sedan. To those wondering-- it is essentially a long wheelbased Passat. Let's hope the Superb is more reliable. 29. The Vatican. 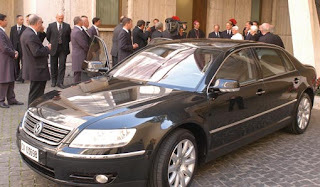 When a man from Bavaria became the latest Pope, Audi/VW, BMW, and Mercedes fought hard to offer the Pope's official car. In the end, the Phaeton won. The 450 horsepower W12 wunder-engine rests under the hood. God-speed! 30. North Korea. This is the shocker. The Glorious Leader also rides in a Phaeton. Due to the secrecy of the regime and limited media access, I cannot find a picture of Kim in the Phaeton for confirmation. But if der Spiegel and VW Vortex have confirmed this, what other proof do I need? 31 and 32. Spain and Portugal. 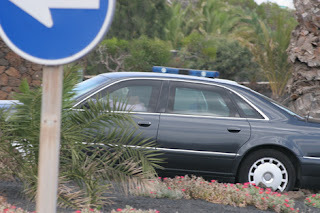 What can I say, socialist Iberian prime ministers love big German sedans. Zapatero has an A8. Socrates, the prime minister of poorer Portugal, rides in a Phaeton. 33. Belgium. In 2003, when a member of the Belgian royal family was caught speeding, PM Verhofstadt publicly criticized him. But immediately thereafter, his car was caught going 111 mph in a 75 zone. What a waffler. A year later, his A8 hits a concrete barrier and rolls thrice. At least the car wasn't flattened like a pancake. Today, we cover six cars which exemplify the character of their owners' respective countries. 22. Ireland. Bertie Ahern's new S350 tells us a lot about Ireland and the present regime. First, Irish nationalism and pride would never allow the Taoiseach to ride in a Jaguar. But more importantly, the choice of the new W221 platform mated with a 241 horsepower 3,724 cc V6 is even more telling. Ahern is credited for making the Irish economy boom in recent years, i.e. the Celtic Tiger. Owning the new W221 is a sign that Ireland has arrived as a junior economic power. Mating it with a moderately powered V6 exhibits fiscal restraint and practicality. 23. Sri Lanka. President Rajapakse, a left-of-center Buddhist and one-time human rights lawyer, is smart but not practically-minded. During his tenure as president, he has failed to use his intelligence to achieve peace with the Tamil Tigers or properly deliver aid to the tsunami victims. Likewise, his E38 BMW is a smart car, but not very practical in Sri Lanka, where many roads are flood prone, in disrepair, or littered with large farm animals. 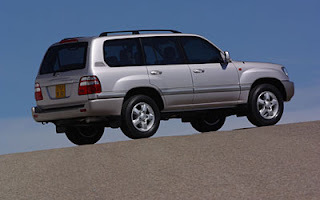 Perhaps a Land Cruiser or Nissan Patrol would better suit the head of the socialist republic? 24. The Netherlands. Financially, people perceive the Dutch in a dichotomous manner-- as either successful businessmen or as cheap bastards. Well, in this round at least, the successful businessman side of the Dutch persona won. Prime Minister Balkenende, a right-of-center Christian Democrat, splurged, and raised a few eyebrows, when he took delivery of a 400,000 Euro 760Li. Well, at least it beats his friend Ron Weasley's Trabant. 25. Malawi. Not much is known about Malawi except that it is poor and at least 20 percent of its surface area is covered by water. 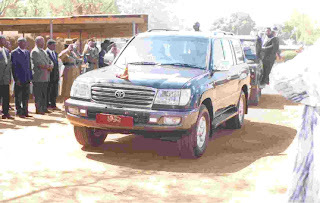 President Mutharika, by choosing a Land Cruiser, rejected the WaBenzi lifestyle and accepted the reality that as the leader of an infant democracy, he is always treading on water. 26. South Korea. As an East Asian economic powerhouse with a vibrant automobile manufacturing sector, it's a no-brainer that President Roh rides in Hyundai's flagship, the Equus. But to declare that it is better than the Lexus LS, Audi S8, et al., is going a bit far, dontcha think? 27. Algeria. 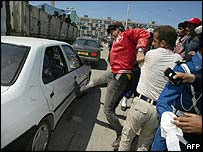 Up until 2002, Algeria was mired in a low grade civil war. President Bouteflika had reason to fear for his own safety. No doubt his white W140 Mercedes is properly armored to protect him from small arms fire and the errant RPG. But does it offer protection from swift kicks by ticked off middle aged men? The United Nations currently has 192 member states. Then there are the two non-members, Taiwan and the Vatican City. That's 194 cars and SUVs, belonging to their respective leaders. What started out as a curiosity for me has transformed into a mission. 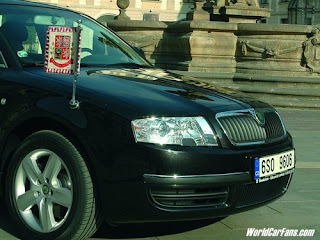 I will do my best in researching and presenting the cars of every head of state in the world. I've got a long road ahead and I may very well cut and run before the mission is accomplished. But I feel a surge coming. 17. Before I go on to today's theme-- Mercedes S-classes for those who really need it-- I want to acknowledge the outgoing (and probably incoming) prime minister of Italy, Romano Prodi. Unlike his billionaire, rightist, and vain predecessor, Silvio Berlusconi, who rode in a Maserati Quattroporte, Prodi chose something much less flamboyant. Because of his more modest constituency (his fragile coalition included the socialists and the Greens), Prodi rode in a Lancia Thesis. The Thesis is a midsized "luxury" car that is woefully underpowered and outclassed by its competitors. With all that Italy had to offer, Prodi showed a lot of conviction and character in choosing this third rate "executive" saloon. Bravo! 18. Georgia. We now turn to the theme of today's blog. In my African piece, I argued that leaders there chose Mercedes to show off their wealth and to basically give the impoverished, diseased, and oppressed people they ruled the middle finger. 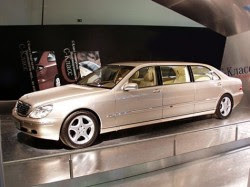 Today, I will discuss leaders who truly need armored, powerful Mercedes because they literally need a portable vault in which to commute. Being President of Georgia is a dangerous job. Being a pro-Western, pro-NATO president in Georgia is even more dangerous. 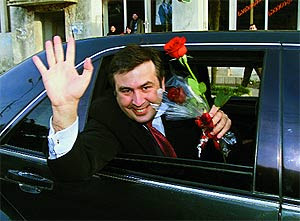 That is why President Saakashvili rides in a W140 S-class Mercedes. 19. Philippines. Being the leader of an Asian banana republic with a brewing Muslim insurgency is also a dangerous endeavour. Like her counterpart in Georgia, President Gloria Arroyo has a W140 packing a V12 carting her around. 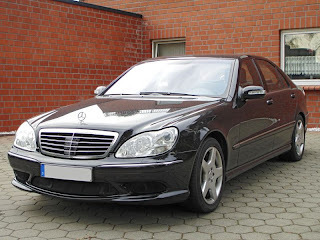 Because both countries are not exactly rolling in dough, both leaders showed restraint in not replacing their rides with the new W220 or even newer W221 S-class Mercedes. No, that would be too Marcos-ian. 20. Pakistan. 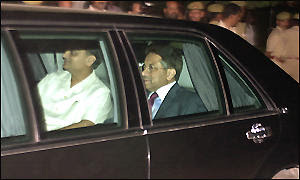 Someone who knows a thing or two about assassination attempts while riding to work is Pervez Musharraf. Within a span of two weeks in 2003, Musharaff's W140 Pullman saved him twice. On the first attempt, the W140's jammer delayed the detonation of a roadside bomb. Eleven days later, two suicide bombers blew themselves up, only to slightly crack the W140's windshield. Now that's executive protection! 21. Ukraine. When sinister forces try to surreptitiously poison you with massive doses of dioxin, you need a car that will act like a lead cocoon. That's why when Victor Yushchenko, a successful banker with a penchant for Stuttgart's best, became prime minister, he opted for an S600. 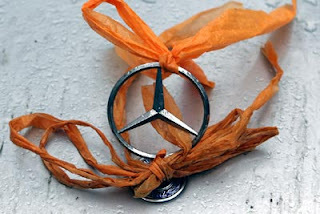 The orange revolution and Benz have been closely intertwined ever since. I now take you to sub-Saharan Africa. The operative word for today is "WaBenzi". It is a Swahili term that describes the ultra-rich and the ultra-corrupt, i.e. those who ride in chauffeured Benz'. Researching these leaders' rides have made me physically ill. The injustice is beyond words. In retrospect, I admire Lula for picking a lowly Chevy. 12. Zimbabwe. Mugabe the land reformer rides in perhaps the most fuel inefficient passenger car in the world. His Mercedes S600 Pullman weighs 5 tons, with armor. 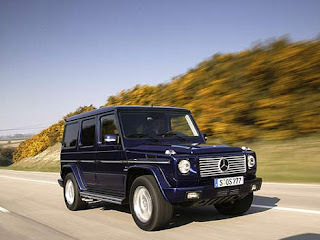 It is propelled by a 7.3 liter twin turbocharged V12. But with that gargantuan engine lugging that much mass, each tankful of petrol will only move the car 200 kilometers. Truly atrocious (the car, not Mugabe, of course). 13. South Africa. Mbeki is transported in a Mercedes S600L. The question is, which one. 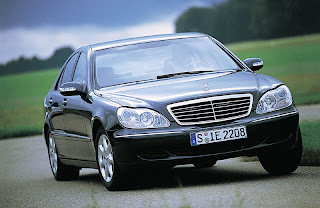 Research has turned up stories about numerous S600s "given" to Mbeki. One was a gift from the people of Libya. Another by a favor-seeking contractor. Mbeki was accused of "test driving" a third S600 for six months. The test drive lasted so long, in fact, Mbeki had bulletproof glass installed in the car. 14. Swaziland. King Mswati III takes the cake. 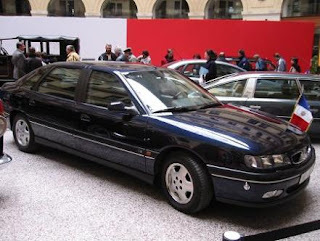 In this, the last absolute monarchy of Africa, the king bought himself a Maybach 62 (a glorified Mercedes). Not being selfish, he also bought each of his ten wives a BMW X5. What's wrong with this picture? The country lives in abysmal poverty; the average life expectancy hovers between 32 and 33 years; and 38.8% of its people suffer from HIV. 15. Kenya. Mwai Kibaki was elected into office in 2002 on a platform of fighting corruption. He criticized the incumbents and their massive fleet of E220 Benz'. 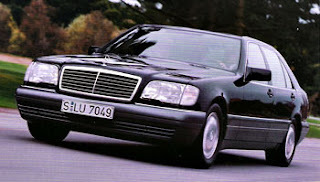 When Kibaki swept into power, he ditched the E220s and replaced them with E240s. And for himself, an S600L, of course. What else but the best from the land of the original WaBenzi. 16. Rwanda. Paul Kagame gives us some small glimmer of hope. Though his ride is a black Mercedes Cross Country (a Gelandewagen), he actually drives himself. Though he is no angel, he is much more grounded than his peers. As expected, finding the rides of Third World heads of state was much more difficult. Today, I am focusing on some Latin American leaders. I am pleasantly surprised by the diversity of cars used. Not one Mercedes S-class came up today. I give you the second installment. 7. Chile. 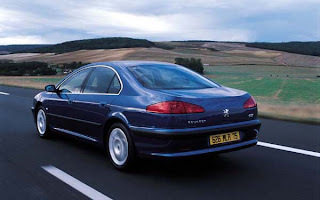 Michelle Bachelet, the former pediatrician and political prisoner, chose the most unique vehicle-- a dark blue Peugeot 607. Her rejection of American and Teutonic offerings shows that she is independent, forward thinking, and a free spirit. This is the most unique choice, by far. 8. Colombia. Toyota Land Cruiser. President Uribe's predecessor was rumored to have five identical E38 7 series BMWs with identical plates to thwart any attacks. When Uribe came into office, he deemed them unnecessary luxuries and opted for a simple Toyota Land Cruiser. Whether or not you agree with his politics, it speaks well of his judgment. It shows that he is tough, frugal, and practical. 9. Argentina. Audi A6. Nestor of Santa Cruz rides in the new Audi mid-level sedan. It is no doubt a nod to his Swiss heritage. It lies somewhere between austerity and ostentaciousness, without being either. It is just the economic message the center-left El Presidente wants to send to his people. 10. Bolivia. 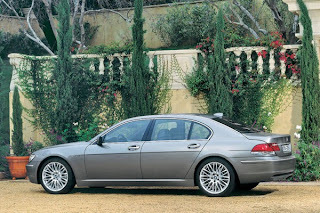 BMW 7 series. When I saw footage of Evo's motorcade, I was a bit disappointed. 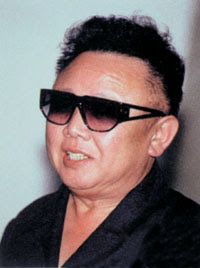 This leader indigeno rides in a black, tinted, long wheelbased E38. He needs to trade in his ride, post haste. That just ain't right. 11. Brazil. Chevy Omega. 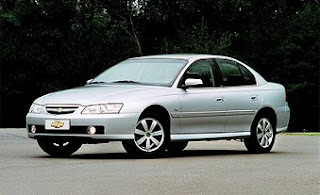 Lula's offical car is an imported and re-badged Holden Commodore, a mid-sized Aussie with a V6. This underwhelming car is very unbecoming for the leader of one of the largest countries in the world. Lula may have chosen it because of his working class background and his impoverished supporters. But to have this Chevy as the official head of state car just says: Brazil will always be a second rate country. I say-- no consideration of a permanent U.N. Security Council seat for Brazil until a better car is chosen. 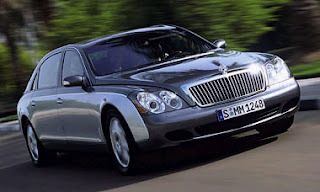 Recently, I saw footage of Chinese leader Hu Jintao on a visit to Sudan riding in a Maybach. I assumed that it is from Omar Al-Bashier's personal fleet. This led me to ask, what the hell are heads of state around the world riding in? What do their choices (or lack thereof) say about the leader and his/her country? Research has been more difficult than expected. Part 1 will include the easy ones-- those from the big boys (and girl). As this series progresses (hopefully), we'll get to some pretty obscure countries. My bet is that most of the third world leaders rely on Benz'. But we shall see. 1. Great Britain. Tony Blair rides in a bottle green Jaguar Super 8, a long wheelbased, supercharged XJ8. It is stately, powerful, and very British. 2. Germany. 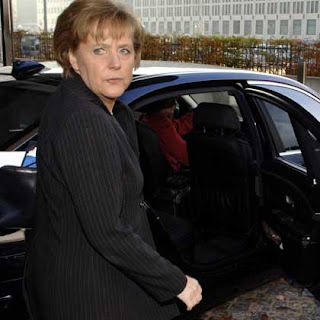 The W12 powered Phaeton, the People's Car, moves Frau Merkel. Her country, known for making the world's best luxury saloons, chose the proletarian Volkswagen over the Benz, BMW, and Audi. With 443 horsepower under the hood, it can still whisk her (and over 1,000 kg of armor) away quickly-- Mach Schnell! 3. France. Renault Safrane Biturbo. The what? Huh? The dirth of luxury saloons in Renault and Citroen's current line-up means that poor Jacques has to ride in a used, underpowered (246hp) hatchback. Did I mention that it has a manual transmission too? Sacre bleu! At least his other car is a four door Citroen SM convertible. 4. Canada. 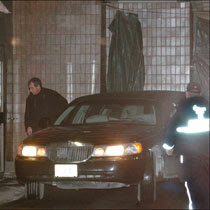 Stephen Harper's Lincoln Town Car is seen here at a hospital entrance after he recently suffered an asthma attack. The choice of wheels is bland, conservative, and very North American. 5. Australia. GM's Holden division Down Under produces the Statesman. 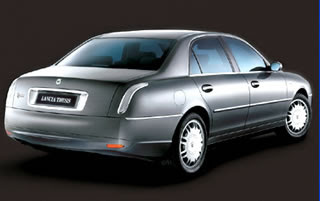 It is the largest rear wheel drive sedan made by the General, anywhere. It seems that many of these executive cruisers are white. I shall assume that is because it reflects the heat of the hot Australian sun, thus making it more comfortable for the blokes in suits inside. 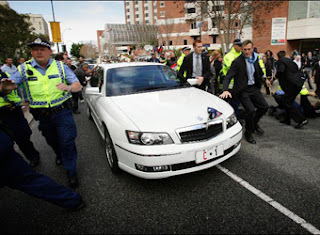 Here is a shot of John Howard's Holden under attack last summer (or winter) in Perth. Popular guy, him. In the late 1960s, Japan was making great strides in recovering its pre-war industrial glory. However, abroad, and especially in the West, Japanese products were still thought of as cheap, poorly built, and just plain crap. Two brothers in Japan, one in his early 20s, the other a few years older, pooled their life savings together and realized that they did not have enough to buy the ultimate Japanese sports car-- the Toyota 2000GT. 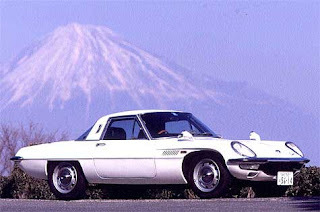 So they bought the next best thing, the Mazda Cosmo. At $4,100 U.S., it was a lot of money for two underemployed men in what was essentially still a third world country. Suspicions that their parents chipped in for the car are probably accurate. Not much else is known about these two guys and their Cosmo. What is less of a mystery is the Cosmo itself. 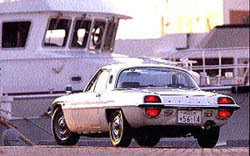 It was the first Mazda fitted with a two-rotor Wankel engine. Mazda bought the rights to produce and develop the rotary engine from NSU of Gemany (a story for another blog). It had an astronomical (for its day) 7000 rpm redline and dubious reliability. To this day, Mazda has yet to come up with a durable, non-fussy, rotary engine. 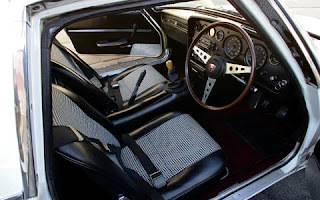 The Cosmo, with a 92 1/2 inch wheelbase, had a cramped two-seat interior. The unusually tall brothers found it hard to drive, or sit in the passenger seat, comfortably. 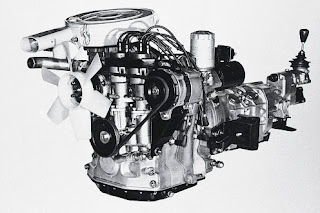 The 982 cc rotary engine produced an impressive 110 horsepower and 96 pound feet of torque. It was quick because it weighed just a tad over a ton. The controversial design of the car certainly attracted attention for the brothers who owned the Cosmo. They probably enjoyed every moment of it. It also helped that the Cosmo was ultra-rare-- only one was built per day at Mazda's Hiroshima factory. In writing and researching this, I have become more curious about these two brothers and their Cosmo. I think the next time I speak to the younger brother, I'm going to ask, "So, dad, what can you tell me about the Cosmo that you and your brother owned?" 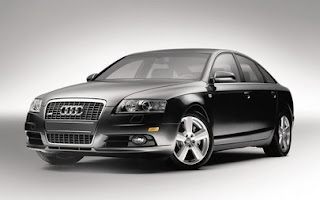 Over the past 25 years, there have been a lot of fast sedans from at least half a dozen carmakers, mostly from Europe. But one series consistently leads the pack in power, sophistication, dynamics, and yes, even affordability (relatively). 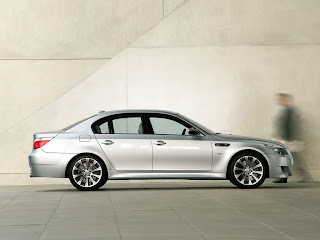 That series: the BMW M5. The E28 got the M5 ball rolling. 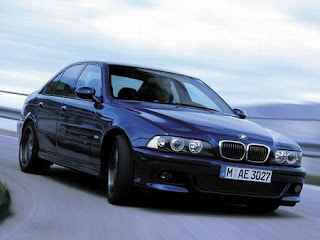 With a detuned twin cam inline six from the M1 mated to a 535i chassis, BMW gave the world the first M5. It became the fastest sedan in the world. Even by today's standards, almost a quarter of a century later, it is fast-- 60 mph in 6.2 seconds. A top speed of 153 miles per hour. 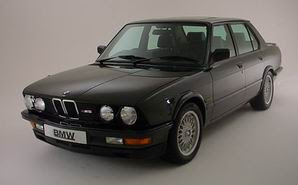 BMW continued the tradition with the E34. They continued to be hand built. Legend has it that BMW's test drivers could tell which team built which cars because they all handled and performed slightly differently. To see how they perform under real life situations, look no further than the one featured in Ronin. 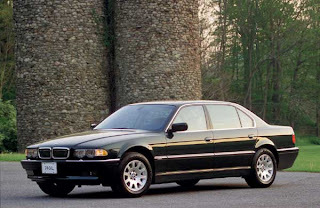 It put the venerable 450SEL 6.9 and the newer S8 to shame. Of all the M5s, I coveted this more than any other. When it first came out, a guy who worked on the same floor as me had one. He admitted, sheepishly, that he never took it over 80 mph. Only decorum and grace kept me from slapping this guy in the face. Sacrilege! BMW will build better and faster M5s in five year increments, forever. But this will always be my favorite. I know little about the latest iteration of the M5. Chris Bangle's influence (or mangling) is obvious. The performance numbers are impressive. For the overly paranoid or environmentally conscious, a dial offers 300, 400, or 500 hp on tap. There is an argument that there are so many gadgets and computer aids in this car, the car loses touch with the driver. The connection between car and driver is the very essence of BMWs. Maybe the E60 marks the end of M5 uber alles. What is wrong with the 737 Max? Toyota Camry: Lane departure system annoying. Toyota Century: A dream come true. Nissan Altima: It has an O/D button! The E-Myth: Attorneys: Some good ideas. The E-Myth: Some good ideas. On Saudi Arabia: KSA is screwed. Obsessions Die Hard: Motorcycling the Pan American Highway's Jungle Gap: Perfect read. Louie, Take A Look at This! : A must-read for Huell Howser fans. The Drive: Searching for Lost Memories on the Pan-American Highway: Inspires me to just write the damn book. How to American: Quick, fun read. The Big Necessity: Mildly interesting. 101 Ways to Victory: Quick read on running for office. The Long Haul: Fun read re truck driving.